We love our apartment and neighborhood. The major decorating and assembling is behind us. Here are two tables I refurbished. I documented the process and posted photos on my flickr stream if you want to see the various stages. Oh and take a listen to the newest MITM podcast. The coffee table was originally a dining table. In college I found it. 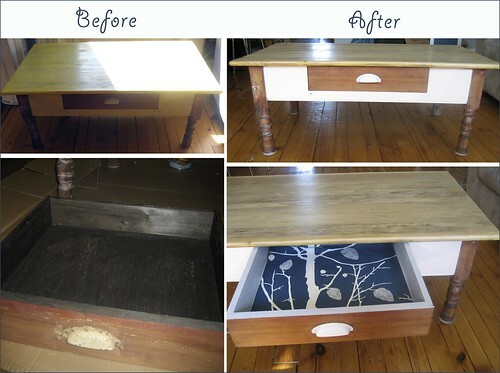 It was an old, shoddy turned leg table that needed love. I cut the legs down to coffee table size and stained the top and sides yellow and the legs a burgundy wine color. Then I waxed it. Later it found it’s way into my parent’s house and garage. But when we moved they suggested that we take it back. I still loved the shape of it but the bright yellow did not work with our decor. So I stripped it (with an eco-friendly stripper that was less caustic and not as effective sadly), sanded it (wet and dry), steel wooled it. Finally I verathaned the top, painted the sides a tea rose and Watco oiled the wine colored legs. I also painted the drawer and pull and lined the inside with stunning wallpaper from Ferm Living (the same paper I’m going to use for the entry wall). Et voila. The dining table was my parent’s and mine growing up. I had many a meal there and drew many a picture. For the last 10 years or so it was sitting in my aunt and uncle’s basement collecting Charlotte’s webs. We got it back, sanded it down, and Watco oiled it. It still has that old look but the oil made it look very fresh and shiny. I put modern chairs with it. Actually we got 8 chairs and they fit all around but when it’s not in use I stack the chairs in the corner and push the table to the wall so that the room keeps it’s open look. materials: Danish Watco oil, Verathane varnish, paint (I used Ralph Lauren Tea Rose), sandpaper, rags, paint stripper (eco), steal wool, putty knife, brushes etc. If anyone wants to do this at home, I highly recommend it. It was simple and the results were great. Do set aside a good chunk of time. One Response to Table Tuesday!! 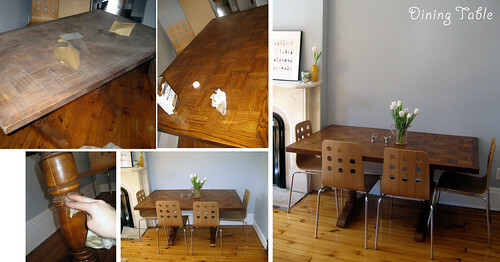 : My DIY table refurbishing. You are GOOD in refurbishing Furitures. I am refurbishing a Coffee Table with Oak Finish. I purchased Winmax Golden Oak Stain. I snded and cleaned the Table and then applied a coat of New Golden Oak Stain with a Brush. Some Spots may be 5 % are darker than the remaining Area. Is there any way to hide them ? I do not want to Bleach it. Pigmented Wood Stain will hide those Darker Spots ? Please respond to ryadav02@verizon.net f you get this Message.